No one has ever accused New York City of understatement. Yet it was in the service of subtlety that five gilders — such artisans still exist — could be found clambering in mid-September over the Sherman Monument at Fifth Avenue and 59th Street, in Grand Army Plaza. At first, their work seemed counterintuitive. Or at least counterproductive. 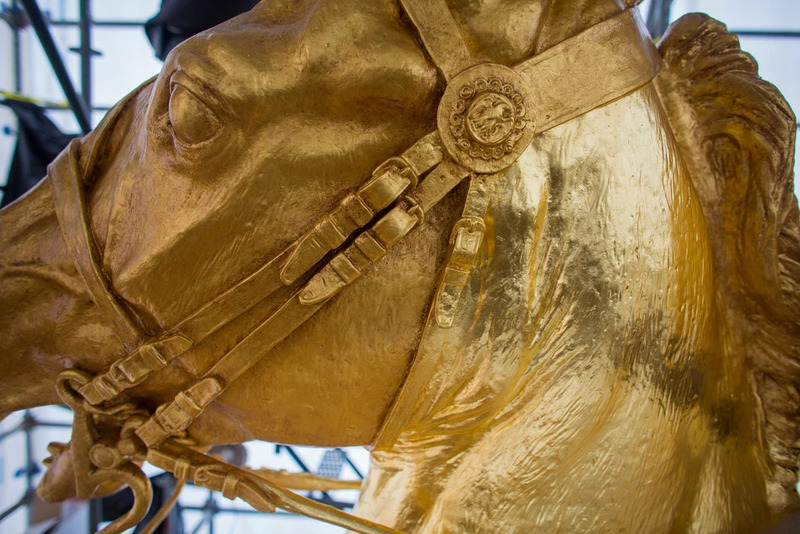 At the end of August, they had painstakingly covered every bump, hump, appendage and protuberance in the heroic equestrian statue of Gen. William Tecumseh Sherman by Augustus Saint-Gaudens with 1,200 square feet of 23.75-karat gold leaf. That left the 110-year-old sculpture as breathtakingly brilliant as a newly struck proof coin. But then they came back to tone the whole thing down with a glaze of burnt sienna, burnt umber and lamp black pigments. The glaze was darker than muddy espresso as the gilders brushed it on to the sculpture’s undulating surfaces, stippled it into the pores and crevices of the bronze and wiped it gently away with rags. The reporter David W. Dunlap visits the monument of Gen. William Tecumseh Sherman, a decorated Civil War hero, at the southeast corner of Central Park. Michael Kramer, the head of the Gilders’ Studio of Olney, Md., who was supervising the job, confessed that he had approached the toning with ambivalence. Sherman in a luscious blanket of nearly unadulterated gold had made for a compelling spectacle. Quickly apparent, however, was that toning did not dull the gold. It accentuated it. Every crevice in Sherman’s battle-weary face and all the grain in the horse’s nap had become sharply legible. The upraised hand of the allegorical Victory figure seemed soft enough to caress. The surface looked like bronze again, but a bronze that glowed from within. One could imagine creatures of flesh, rather than chocolate Easter rabbits wrapped in bright foil. 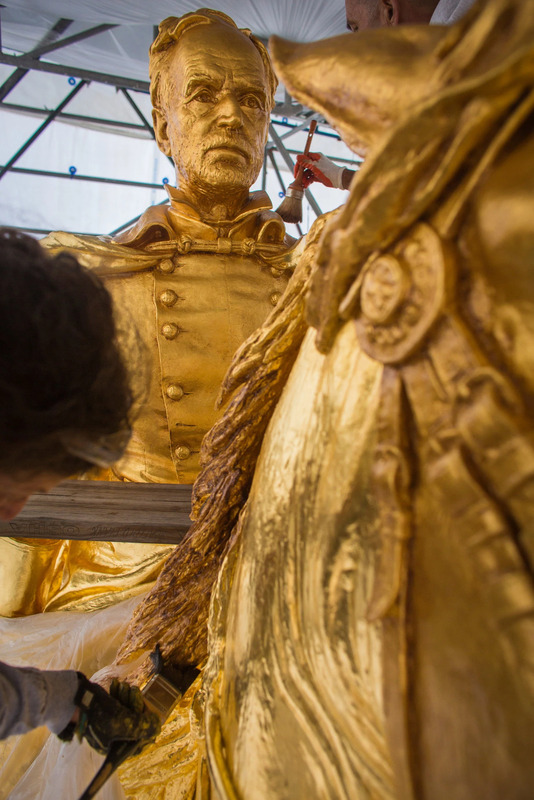 “It’s one of those things that Beaux-Arts sculptors dealt with to a degree that contemporary sculptors never do: you were trying to give a sense of life,” said Henry J. Duffy, the museum curator at the Saint-Gaudens National Historic Site in Cornish, N.H., and an adviser to the Sherman Monument project. It was the original intent of Saint-Gaudens that toning be added to the gilding. 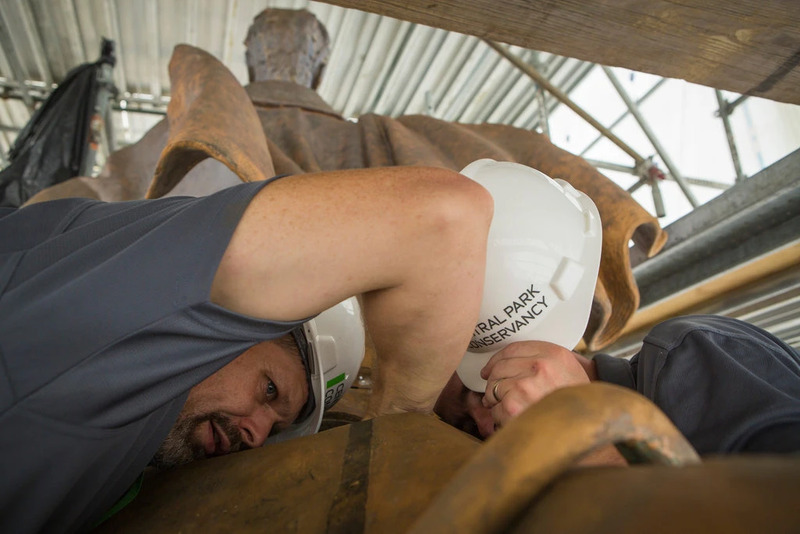 New Yorkers will have the chance to judge for themselves at the end of the month, when the monument is unveiled after a $500,000 conservation by the Central Park Conservancy, which manages the park and is responsible for the upkeep of its many monuments. The money was raised privately. It also allows the conservancy to hope it can avoid a repeat of the great gilding controversy of 1990, when the Sherman Monument emerged from an earlier restoration so dazzlingly gilded that its tasteful Fifth Avenue neighbors practically had to draw their velour curtains against the blazing light and retreat to their fainting couches. Building Blocks also paid a call on the general in late August, when he was briefly at his most lustrous. Most passers-by were unaware of the transformation, since the monument is enclosed in scaffolding. Within the enclosure, Mr. Kramer and his colleagues rubbed gold leaf from paper tissue in long rolls and small sheets made at the Giusto Manetti factory in Florence, Italy. The bronze surface had been primed, then prepared with a slightly tacky coating to which the ultrathin leaf could be transferred with the least amount of pressure. The gilders used squirrel-hair brushes to ensure that every nook got its gold, even the little hollow formed by a fold in Sherman’s tunic behind an unbuttoned button. It occurred to this reporter to rub vigorously against the fresh gilding and leave the park with enough residue on his clothes to retire early. However, I learned that the leaf is so finely worked that only 12 ounces of gold were used to cover the entire monument. The total bill for the leaf was $40,000. I would have been lucky to get out with 50 cents’ worth. Instead, I asked Mr. Kramer, 61, how one gets into the gilding business. He said he had worked for a master decorative painter when he was an undergraduate at the University of Maryland in the late 1960s. The painter’s clients included embassies and churches, and Mr. Kramer learned the joys of gilding. It was that, he said, or social work.